Beautifully engraved certificate from the First South Bank issued in 1995. This historic document was printed by the American Banknote Company and has an ornate border around it with a vignette of an eagle. This item has the printed signatures of the Company’s President, Chairman and Secretary. 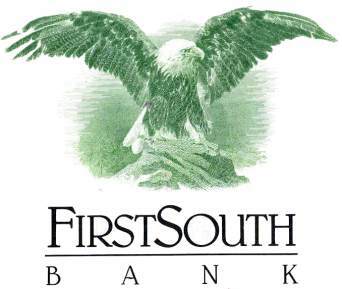 On August 17, 1995, First South Bank was acquired by Regional Financial Corporation, a wholly-owned subsidiary of Regional Investment Fund, Ltd., a privately-held Florida limited partnership, with its principal office in Tallahassee, Florida. 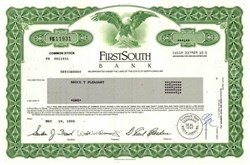 At the time of acquisition, First South Bank consisted of only one facility located in Holiday, Florida, with total assets of $94,000,000. As of May, 2002, there are eleven full-service branches, three limited service branches, and eight loan production offices with total assets of $1,528,826,859.